When the director says “Action!” the film starts rolling and actors and actresses starts acting their role. This bears a resemblance to a kitchen scene. The executive chef shouts “Fire!” when someone places an order. Everyone has to move simultaneously, like an orchestra; the chef is the composer, the staff are the musicians, and the line cook is the conductor. As a line cook, you must have the ability to focus even under extreme pressure. 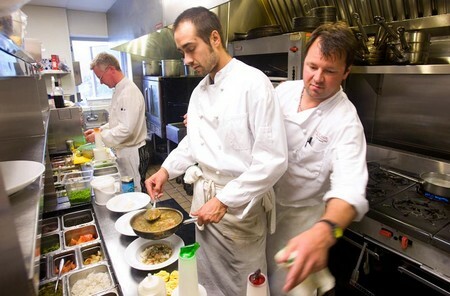 A line cook must have outstanding organizational and communication skills. It requires a great deal of strategy and timing as well. In addition to professional training, hard work and dedication will pave the way to master the skills of an efficient line cook. They say practice makes perfect. So practice creating, preparing and cooking your own dishes for your family and friends. Get their feedback as much as possible, then use this constructive feedback to facilitate your own improvement. Be creative and willing to experiment with your own recipes too. Create a diary of your own recipes, including the ones you have collected. Research and read more about culinary books to give yourself familiarity with the ways of cooking. Look for good culinary training programs in your area. These don’t have to focus exclusively on the art of cooking. Find a program that caters to a wide range of topics in the hospitality industry, customer service and people management. This training will prove essential in your role as a line cook. Get yourself a job in culinary industry establishments like restaurants, cafés and hotels while in college or the training program. This will serve as your stepping stone to get in to the job you would really love doing. You might work at first as a kitchen helper or staff. Treat this as an opportunity to learn and gain experience in a real kitchen situation. You will gain valuable knowledge from people with whom you work and the day-to-day action. Strive hard to get the position you desire. Patience and hard work plus respect for your fellow employees will earn you a good reputation. Show your capability as a team player and how well you work with and relate to others. Discover the art and skill of managing a team by observing and learning. You must not stop learning. Take proactive steps by seeking counsel and direction from those above you. Immerse yourself in studying and learning about this field through experience and observation. Learn all these things by mind and heart. Keep yourself updated about the latest trends and developments in the culinary business. Make your peers feel they can rely and depend on you. Maintain flexibility in your work shifts. Cooks don’t often get a holiday break or a weekend off. If you can manage your life around your demanding job, you can surely manage organizing a kitchen when the right time comes. About the Author: Alan Kennon lives a very happy life with two kids and a lovely wife. He likes to share his life time experiences with others about how they can improve their lifestyle and personality.